Climate change poses a serious threat to social and economic development in India and in particular to the Indian Himalayan Region (IHR): instability in the Himalayan ecosystem as result of climate change impacts is contributing to changes in the composition and distribution of natural resources, including water, forest and agro-biodiversity; the region is facing increased frequency and duration of extreme weather events and natural hazards; and there is also potential for changes in river flows due to climate and non-climate induced stressors, which can impact local livelihoods and long-term food security of the country. Scientific capacities to understand changes in this region and strenghten related policy are therefore critical. In response to this need the Indian Himalayas Climate Adaptation Programme (IHCAP) aims to enhance the resilience of vulnerable communities in the Indian Himalayas through strengthening the capacities of Indian institutions in climate science, with a specific focus on glaciology and related areas, as well as institutional capacities of Himalayan states in India on adaptation planning, implementation and policy. IHCAP is a project of the Swiss Agency for Development and Cooperation (SDC), and is being implemented in partnership with the Department of Science and Technology (DST), Government of India. The programme supports India’s National Mission for Sustaining the Himalayan Ecosystem (NMSHE), a mission of the National Action Plan on Climate Change (NAPCC). In India IHCAP is anchored under the Framework of Science and Technology Agreement of November 2003 between the Swiss Federal Council and the Government of India and is being implemented as a bilateral cooperation programme with Department of Science & Technology. The programme comprises two phases: Phase I undertaken over 2012-2015, and Phase II during 2016-2019. This article highlights the achievements of Phase I. In Phase II, IHCAP is outscaling its activities to 12 Himalayan States. Himalayan glaciers, the “Water Towers of Asia”, are currently receding at a rapid rate, increasing the risk of Glacial outburst floods (GLOFs) and changing the landscape of water resources and availability. Komik, the world’s highest village at 4,587m above the sea level, used to receive snowfall two- to three-metres deep; this provided sufficient soil moisture for growing barley (their only crop), and helped to build-up glaciers to ensure year-round water availability. However, the Chocho Khanyilda glacier, Komik's lone water source, has been shrinking and snowfall has reduced to less than a metre, resulting in the disappearance of glacier springs and significant reductions in farm yields due to insufficient irrigation. Similar stories can be found in the villages of Langcha and Thankarma, nestled in the Spiti and Kinnaur districts, and Ladakh, India’s other cold arid district. Despite their importance, Himalayan glaciers have not previously been extensively studied and national policies only make passing references to them. This is partly due to disconnects in government, but also a lack of knowledge. To better understand the changing behaviour of Himalayan glaciers in the wake of climate change and their influence on global warming, Indian scientists have for the first time set up a high-altitude glaciology research station, HIMANSH. The facility is being used to quantify and monitor glacier retreat, glacial lake dynamics and the impact of debris and pollution on the glaciers, amongst other parameters relevant for decision-making and policy development. To spread awareness of these issues, IHCAP has also hosted four media workshops in 2014 – 2015 to improve journalists’ understanding of climate change and adaptation issues in the Himalayas. During the workshops, it was found that there was a demand for more initiatives of this kind. The "Himalayas, Climate Change and the Media – A Manual for Journalists" has been developed to meet that demand and to help journalists cover climate change and adaptation issues in the Himalayas with more accuracy and understanding. A manual has also been produced as a guide for trainers conducting workshops for journalists on climate change and adaptation issues in the Himalayas: "Himalayas, Climate Change and the Media – A Trainer’s Manual". In Phase II, the focus of the media awareness workshops have been shifted to improve the capacities of vernacular media and journalists to improve climate change reporting and awareness among communities. So far, six state level media workshops have built the capacities of over 160 journalists. As part of the media engagement, a fellowship programme has been initiated, which is resulting in in-depth stories on climate change impacts and voices of local communities. To learn more about the threats posed by the loss of glaciers in the Indian Himalayan Region, the efforts underway to study them, and the issues with mainstreaming glaciers into policy, read the article "On Thin Ice" by Shreeshan Venkatesh, and the photoessay "Living on Thin Ice". IHCAP is also providing technical support to State Governments in the Indian Himalayan Region to build capacities of officials on climate change adaptation planning and implementation. In Phase I, the focus was on the state of Himachal Pradesh. A combination of orientation and in-depth training programme was designed and implemented. 127 state government officials of Himachal Pradesh were trained during Phase I. 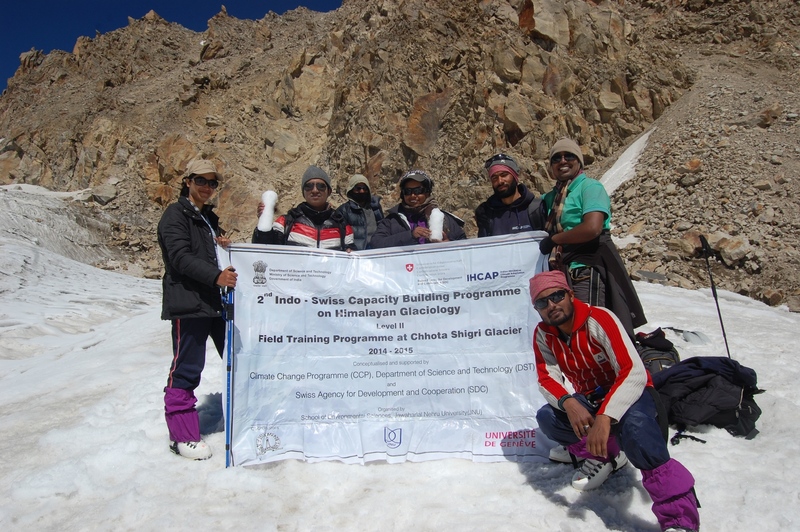 Read the related IHCAP reports on "Training Needs Assessment for Adaptation Planning and Implementation in Himachal Pradesh" and "Capacity Building for Climate Change Adaptation Planning and Implementation in the Indian Himalayas". In Phase II, two different sets of training programmes are being out-scaled to all 12 Himalayan States. One training programme is on climate risk and vulnerability assessment with the objective of assisting State government to improve their in-house capacity and revise/review their State Action Plan on Climate Change. The second set of capacity programme is a combination of orientation and in-depth training on adaptation planning and implementation with the focus on design of adaptation projects including access to climate finance. This is South Lhonak glacial lake - sublime in appearance, forbidding in character. Located at the snout of South Lhonak glacier in the north-eastern State of India, Sikkim, the lake has been expanding at an alarming rate due to receding Lhonak glacier. This, scientists warn, is like a powder keg waiting to explode. Linked to the monitoring of Himalayan glaciers is the management of risk relating to glacial outburst floods (GLOFs), which pose a major threat to communities within the Himachal Pradesh. GLOFs not only result in loss of livelihoods and damaged infrastructure (incuding habitations, roads, hydropower infrastructure and agricultural land), but also morbidity, mortality and food insecurity. They can also cause loses forest and biodiversity, and the displacement and migration of local communities. For communities living in this region, the threat from such natural hazards is real and increasing. In response to this threat IHCAP undertook a first-of-its-kind study in Kullu district of Himachal Pradesh to assess the region’s climate vulnerability, hazards and risk. The study identified Parvati Valley and Upper Beas catchment regions as the zones with the highest hazard with respect to natural hazards such as floods, cloudbursts, landslides, etc. Despite these enormous risks and past disasters, the communities surveyed do not have or are not aware of appropriate response strategies to the impacts of climate change. In this context, IHCAP in partnership with the Government of Himachal Pradesh, has developed three project proposals which draw on the Kullu studies, and experiences elsewhere in the world, to reduce the flood and GLOF hazards risk in Parvati Valley, to enhance adaptive capacity of communities through agri-horticulture interventions in Banjar region and to improve the reslience of communities through eco-system based adaptation in the Great Himalayan National Park. The project proposals having been endorsed and submitted by the state government of Himachal Pradesh, are being actively considered for funding under India's National Adaptation Fund on Climate Change. For example, the project on flood and GLOF hazard risk focuses on: the mapping of flood and GLOF hazard areas and vulnerability the establishment of a modern and sustainable early warning system with last mile linkage to communities; the mainstreaming of this system into the District Disaster Management system in Kullu district; and capacity building of vulnerable communities through demonstration of the community-based flood and GLOF-related risk management system. The early warning system will utilize the latest scientific understanding, monitoring technology, and local knowledge to forecast and warn of imminent threats to lives and infrastructure. Read more about this project in the Synthesis Report: Climate Vulnerability, Hazards and Risk: An Integrated Pilot Study in Kullu District, Himachal Pradesh, the Science Brief on Flood Risk and Eary Warning Systems and the project proposal. Read the stories of the communities living with these threat in the webstory "Living in Fear: An Early Warning System for Flood Risk in Parvati Valley, Himachal Pradesh" and the photo essay " 'WARNING SIGNS' IN THE VALLEY OF GODS - An Early Warning System for Flood Risk in Parvati Valley, Himachal Pradesh". Other highlights from IHCAP include work on: ecosystem-based adaptation as an Integrated response to climate change in the Indian Himalayan Region (IHR); vulnerability and risk assessments in the IHR; investigation of urbanisation challenges in the IHR in the context of climate change adaptation and disaster risk reduction; and the importance of mountains globally in the context of climate change adaptation, including a synthesis of concrete adaptive actions that are being taken in many mountain areas of the world. A state-of-the-art integrated framework for vulnerability, risks and hazards assessment developed and applied in Kullu district, Himachal Pradesh. 13 collaborative studies conducted between experts from India and Switzerland on topics such as climate baseline, cryosphere assessment and risks and hazards assessment in Kullu district. Based on the studies, 25 research publications have been published in scientific journals and presented at national and international conferences. 120 journalists sensitized to climate change adaptation in the Indian Himalayan Region through four media workshops. As an outcome of the workshops, about 30 news articles on climate change adaptation issues were published. Rs. 43.86 crore mobilized under the National Adaptation Fund for Climate Change (NAFCC) through technical assistance provided for climate-resilient agriculture in Himachal Pradesh and Jammu and Kashmir. 143 Himalayan researchers’ understanding of environmental challenges strengthened including on climate change impacts. Over 26,000 individuals reached out through pre-arrival, on-platform and post-departure activities in support of the Science Express Climate Action Special train. For more detail see the IHCAP website and the IHCAP Phase I achievements brochure. Project proposal: "Reducing Glacial Outburst and Flood Risk in Parvati Valley of Kullu district, Himachal Pradesh"